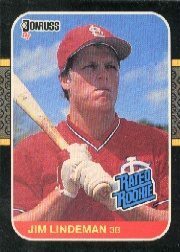 Jim Lindeman seemed like a working-class player. Not a hit-in-your-sleep kind of guy, but someone who’d use brains and determination to defy the odds. Q: Your first career homer came off Jim Deshaies Sept. 5, 1986. What do you recall of that hit? A: The HR off Deshaies was a high fastball and I hit it into the first few rows of left field in the Astrodome. I still remember the crack of the bat. Q: You racked up nine post-season hits in 1987. What moments stand out for you? A: The 1987 post-season is kind of a blur. It all went so fast and it is hard to recall anything. I do remember Jeffrey Leonard and the ‘one flap down’ stuff and the intensity of the NL playoffs. There was much less pressure in the World Series. Q: You became a clutch pinch-hitter. Is one pinch-hit you’re proudest of? A: I don’t have a particular hit in mind, but the 1991 season with the Phillies was my most successful pinch-hitting season. Coming Friday: a Virgil Trucks birthday update! Happy 95th, Virgil “Fire” Trucks!